This volume outlines what is meant by terms such as 'evidence based practice', 'systematic review', 'efficacy', 'effectiveness'. It summarises, in a systematic fashion, the current evidence on diabetes prevention and care to enable the reader to improve their professional practice. Furthermore, it promotes a critical attitude to the assessment of evidence and engenders enthusiasm for 'lifelong learning'. It also advises clinicians on what to do when there is little available evidence. 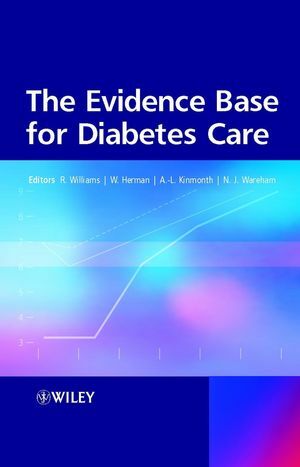 Chapters consider the evidence base for the definition and classification of diabetes, as well as prevention, identification, treatment, education in IDDM and NIDDM. The final chapters look at the practical implications of translating this evidence into practice in different environments with different health care systems and different economic levels. Rhys Williams is the editor of The Evidence Base for Diabetes Care, published by Wiley. W. Herman is the editor of The Evidence Base for Diabetes Care, published by Wiley. A.-L. Kinmonth is the editor of The Evidence Base for Diabetes Care, published by Wiley. N. J. Wareham is the editor of The Evidence Base for Diabetes Care, published by Wiley. PART I: EVIDENCE-BASED DEFINITION AND CLASSIFCATION. PART II: PREVENTION OF DIABETES. PART III: EARLY DETECTION, SCREENING AND CASE FINDING IN TYPE 2 DIABETES. PART VI: PREVENTION OF COMPLICATIONS. PART VII: THE TREATMENT OF ESTABLISHED COMPLICATIONS. PART VIIIl DELIVERY OF CARE.